All tracks by Donovan P. Leitch. 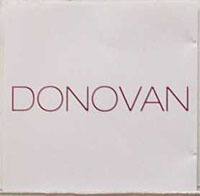 · Donovan: vocals, acoustic guitar on all tracks except 05, harmonica on 03 and harmonium on 05. · David Navarro: mellotron on tracks 02 and 06, background vocals on 02, fender Rhodes on 05, piano and chamberlain on 06. · Danny Thompson: acoustic bass on tracks 01, 03 and 06. · Josh Haden: bass on track 04. · Benmont Tench: keyboards on tracks 03 and 04. · Evan Hartzell: drums on track 04. · Steve Ferrone: percussion on track 05, drums on 06. · Juliet Prater: percussion on tracks 05 and 06. · Michael Severens: cello on track 04. · Gerri Sutyak: cello on tracks 02 and 06. · Pavinder Singh: tabla on track 05. · D. Sardy: bells on track 05.